Fero Power 3 is the latest installment in the Power series from Fero which focuses on battery. Just like it’s predecessor, the Fero 3 comes with a massive 4000mAh battery. The new Power 3 smartphone also sports an improved rear and selfie camera. The design is pretty standard with only minor changes. Fero Power 3 has a plastic and a poly carbonate unibody that is comfortable to hold. The rear camera was placed horizontally at top middle for a unique look. While the Fero logo is seen underneath in style, it also has curved edges as well. Fero Power 3 has a 5-inch IPS LCD display with a screen resolution of 1280 x 720 pixels. The resolution is perfect for a budget smartphone and will bring out the details on the screen pretty well. Compared to its predecessor, the narrow bezels on this device have been reduced. Although they are still visible but it offers a better viewing experience in landscape mode than its predecessor. The top and down bezels still remain the same with no reduction at all. It also has three navigation buttons at the bottom bezels, while the selfie camera and sensors are at the top. There is now a better 8MP camera at the back of the device for all your photography needs. The camera is complimented with a Dual-LED flash for taking pictures in the dark or low light environments. The front facing camera of 5MP also has a dedicated soft flash for a clearer selfie. Running the show behind the scene is a Mediatek MT6580A chipset with Quad-core processor that clocks at 1.3 GHz. The Power 3 has 1GB RAM for all your multitasking and 8GB ROM for storing your files and games. If that’s not enough you can always upgrade to 32GB using the SD card slot. It is running the Android 7.0 OS version out of the box, so you get to enjoy the Nougat experience. The Fero Power 3 is powered by a massive 4000mah removable battery, which the company claims can last you a full day . 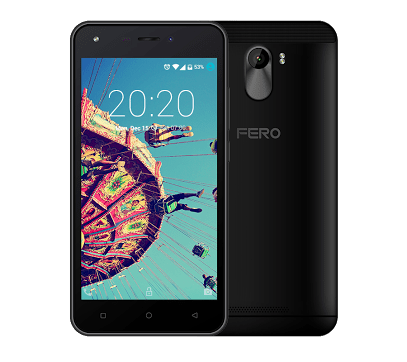 What is The Current Fero Power 3 Price and Availability Status? You can click on the links below to view latest Fero Power 3 price & availability. GearBest |from $53 Click HERE For Best Offers!